Giant of the corporate PC arena, Acer, has announced that it’s launching the ‘Predator’ range of machines designed to provide top notch gaming out of the box. That sounds like an unambitious aim, but Acer reckons that non-technical gamers are being ripped off on a daily basis thanks to obfuscatory marketing tactics which overstate the quality of components inside. The problem is this: the rise and rise of the online PC configurator has been disastrous for anyone looking to buy a new machine who doesn’t have the competency to spec it themselves. Walk into any high street retailer – and a fair proportion of the online ones too – and you’ll find PCs designed ‘for games’ equipped with graphics cards that struggle to run Hangman. Straight out of the box, you’d expect a games PC to be able to play the latest games. That doesn’t seem unreasonable, says Acer, but no-one is actually providing it – at least not without mixing in some sub-par machines and diluting the branding. Enter the Acer Aspire Predator. 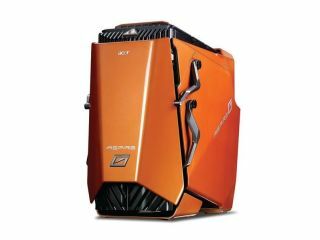 When it arrives in June, there will be four models ranging from around £1200 to £2000, and all of them boast a Penryn quad core processor, SLI graphics and at least two hard drives, which are hot-swappable without opening the side. They also all feature liquid cooling for the CPU, and are warranted for overclocking. To catch the eye of prospective punters, Acer has gone with a very bold case design: all sharp edges and fancy opening mechanisms. It’s not going to suit all tastes, but if the plan was to stand out on retail shelves, it’ll do the job well. TechRadar has had a hands on with the bespoke chassis and first impressions are generally good: with the lifting front plate down it’s quite a looker. Our only concern is potential heat build up from all those graphics cards. The decision to only use SLI configurations means the entry level model has two GeForce 9600GTs, where we’d prefer to have seen one 8800GT, for example, but then hey, we’re a bit more technically literate than the target market. It’ probably use that’s confused everyone in the first place. The machines also come with a top quality Logitech G11 keyboard and G5 mouse, and a 24inch panel in matching copper livery will be available for around £250. While we salute the intention – selling gaming machines that are, you know, capable of playing games, it’s not going to be easy for Acer. It’ll be pitching up against the better known gaming brands, Dell and Alienware, who are also starting to increase their retail presence in stores like PC World. We’ll bring you a full review of the Predator later this month.